Is it time for AirPods to move over? Samsung has revealed its Galaxy Buds headphones, timed to launch at the same time as the Galaxy S10 range of phones. The headphones are a true wireless experience, supporting both wireless audio playback and charging. This means the buds could be easy to lose, but Samsung has you covered. 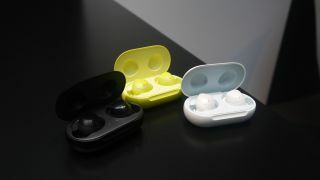 The Galaxy Buds are contained in a carry case, which charges them when not in use. The case itself can be charged wirelessly, although it also has USB-C connection too. This isn't Samsung's first dive into wireless audio – it previously released the Gear IconX headphones, but by changing the name to Galaxy it's clear the company is trying to bring its products together under one brand. There are three different colors of Galaxy Buds to choose from: black, white, or yellow, which is the same for both the buds and the carry case. According to Samsung the bud batteries will last for five hours of calls or six hours of music. The buds run Bixby, Samsung's personal assistant, so you can check your battery, control your Galaxy S10 or change the music without using your hands. They'll cost $149 / £139 (which converts to around AU$210) when they're released, on March 29. We do, however, know that people pre-ordering a Galaxy S10 device in the UK and US will receive a pair of Galaxy Buds for free. Stay tuned for our hands-on review with the Galaxy Buds, and then a full review once we've had extensive time to play around with them.